← StrengthsFinder 2.0: Are You Using Your Talents Effectively? Who Are The Good Guys? Does It Matter? Who are the good guys? Who are the bad guys? Do you know? I often don’t. The attribution of good and bad is directly related to the narrative in which you consume. If you consume the narrative of X, then X will be the good guys and Y will be the bad guys. If you consume the narrative of Y, then Y will be the good guys and X will be the bad guys. Some may argue that it’s not as simple as all that, but isn’t it? Isn’t it as simple as someone (friend, parent, or media outlet), telling you that something is happening and how it affects you, enough to shape your opinion even without your knowing? In doing a quick search of “who are the good guys” on Google, it returns nearly 7,000,000 hits — and that’s with the quotations! This question of “who are the good guys” is not something new. Some search for more ‘trivial’ good guys as in the ones from Star Wars. Others are looking for more historical accounts of good guys like in Watergate. There are even searches for the good guys in Afghanistan (and this was back in 1998)! More recently, it’s been inquiry into the good guys in Cairo and the good guys in Libya. Although, there are still people curious about the feud between China and Tibet. A political leader from Britain, infinitely quotable, once said: “History is written by the victors.” And isn’t that the truth? Once the victors move on from the dispute, don’t they then get to write the “textbooks”? In the past, it would have been the stories they told around the fire, but as humans have grown and evolved to include the written word, what often is passed on from generation to generation is the story as told from the “good guys” perspective. That is, the “good guys” being the ones who won. And isn’t that how it always eventually happens? The “good guys” always seem to win, no matter what. In reading a few history textbooks, I doubt you’ll find stories of the “bad guys” winning. In fact, I doubt you’ll even find many textbooks that offer the perspective of the “bad guys” in much detail, least of all, objectively. The “bad guys” will be painted as “bad guys” who wanted something from the “good guys.” The good guys, being the good guys, of course, triumph! And more history is written where the good guys succeed. There’s a very interesting read on this subject by James W. Loewen called: “Lies My Teacher Told Me.” I’m not saying that what Loewen has written is the “right” view of history, but it provides a perspective that you may not have otherwise considered. 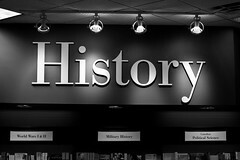 The history of some is not the history of others. It will be discovered, or at least asserted, that the history of the Saxons after their defeat at the Battle of Hastings is not the same history as the history of the Normans who were the victors in the same battle. It will be learned that one man’s victory is another man’s defeat. . . What looks like right, law, or obligation from the point of view of power looks like the abuse of power, violence, and exaction when it is seen from the viewpoint of the new discourse, just as it does when we go over to the other side. . . the triumph of some means the submission of others. This entry was posted in History, Wisdom and tagged Knowledge, Textbook. Bookmark the permalink. Hi Jeremiah, interesting post and very resonant with my life right now! Here in Bahrain, the good guys are the ones who get to write the propaganda. And in every news story there will be reasonable people on both sides. When you ask "does it matter?" I would say, yes it does, if the answer affects lives and livelihoods. However, when it's just a matter of opinion with less consequential impact, that's what makes for interesting conversation, entertainment and growth. I really didn't get too much into my second question from the title "Does It Matter," Did I? Oops. I suppose it was somewhat rhetorical because in my opinion, whoever emerges as the victor, goes on to be the "good guys" (through their writing of history). I'll be coming into parenthood within the next 3 years… I don't know how I would answer this question. Obviously, a baby's not going to be asking me this question, but a 4-,5-, or 6-year old just might. I do like your answers, although, it can be tough to differentiate how one would feel about the perceived "good" and "bad" guys… because one would have to account for where one is hearing about the good and bad. I'm not sure what the media is like in Bahrain, but if channel X favors the blue guys and channel Y favors the red guys, I think the station I watch will have an effect on which guys I think are the good ones and which are the bad ones. good point about the channel. Wach both, I say, then check into tehe frequency with which you are most familar – your own.